We are really excited about our fantastic new playground which is due to arrive this summer. Please do have a look at the link below to take a virtual tour. Designs are also available for viewing in the school foyer. On Monday, Gosberton Academy visited Caythorpe PGL for a taster day of activities focusing on team building exercises. They had to work together to build a buggy that would transport people across the premises. Later they had a go at abseiling down from a very tall building. During the afternoon,they had an opportunity to climb Jacob’s ladder where a friend had to help hoist them up to different stages and heights! Finally, to finish the day they had a chance at completing all aboard which again including climbing up a towering totem pole to get to the top with the encouragement of everybody below. Canada class were very fortunate to have Spalding Fire station visit them on Friday afternoon. They taught us how to stay safe if a fire was to occur and hazards to watch out for at home. We then set fire to our Tudor houses to see how quickly the fire would have spread back in 1666 for the Great Fire of London. We were shocked at how quickly our houses burnt to the ground and some of us were brave enough to have ago at putting the fire out, if only Thomas Farriner was that lucky! On a lovely hot day, Gosberton Academy took part in a Kwik cricket tournament. They competed really well against other schools and finished in an excellent 3rd position. On Thursday 21st June a group of our budding scientists went to Haven High Academy to enjoy a science talk by Professor Robert Winston. This was a remarkable opportunity which was thoroughly enjoyed! The Year 6 Children enjoyed a fantastic trip to Kingswood over the weekend. They took part in various activities that were challenging but fun at the same time. Lots of children conquered their fear of heights as they took part in the fast-paced Zip Wire – it was great to see them having so much fun! There were team challenges such as Nightline and Obstacle Challenge where they had to work together to complete the objective. The entire weekend was filled with laughter and enjoyment, they thoroughly enjoyed it. Some children from Years 4, 5 and 6 visited the Thomas Cowley High School to take part in an athletics competition! They competed in many different events icluding throwing the shot put! We came home with an amazing 38 certificates! Canada and India classes had a fantastic time on Monday 11th June at Yorkshire Wildlife park. Luckily we had beautiful weather as we walked round the park to see the different animals. The children each enjoyed their workshops where they got to hold different critters including a giant land snail, cockroach and a snake. The children were much braver than the adults! The Year 4 girls got the opportunity to visit Spalding High School! They took part in two different lessons: English and Design & Technology. During the English lesson the girls explored the library and went on a treasure hunt to find different genres of books to create a puzzle. In Design and Technology they made their own bracelets by using the oven to melt plastic and moulding it into a bracelet shape. They then got to design and make a box to keep their bracelet in. 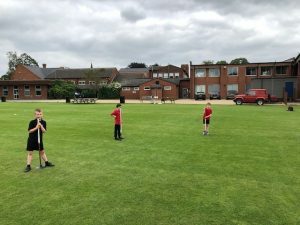 At Spalding Grammar School, the Year 4 boys were treated to a Maths and PE lesson. They learnt about probability and predicted how many times they would roll a number between 1&12. After a break of biscuits and a drink they took part in a fantastic PE lesson and learnt how to play the sport of rounders.